ONE: Chop 2 oz. of Goat Milk Melt and Pour Base into small, even pieces. Place the soap in a heat-safe container and melt in the microwave using 5 second bursts, stirring in between each burst. Using short bursts prevents the soap from scorching. Read more about burnt melt and pour and how to prevent it here. TWO: Add shavings of the Super Pearly White Color Block until the soap has a slight shimmer. THREE: Spray the mold with a thin layer of 99% isopropyl alcohol. Using a dropper, squeeze the white soap into the lettering and the border. 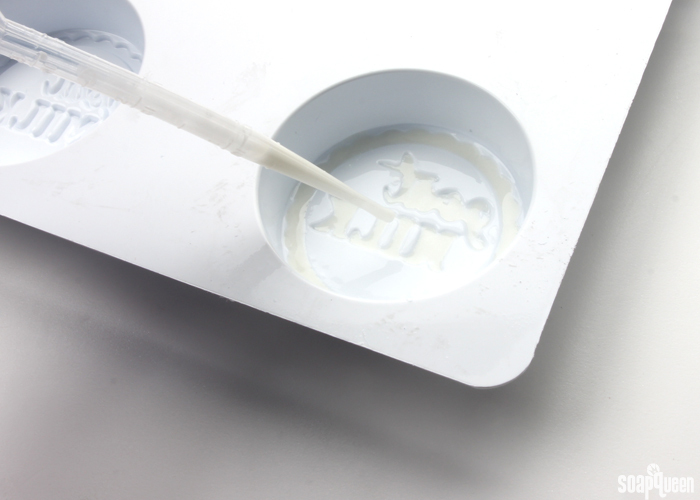 Spraying the mold with alcohol beforehand helps the soap spread easily into the letters and borders. Spritz the top with alcohol to disperse any bubbles. Allow to fully cool and harden. Save the container with any leftover Goat Milk Melt and Pour. If you drop outside the ‘lines’, you can use the back of a spoon or the scraper clean up tool to scrape off any excess soap. FOUR: Chop 11 oz. of Clear Melt and Pour Base into small, even pieces. 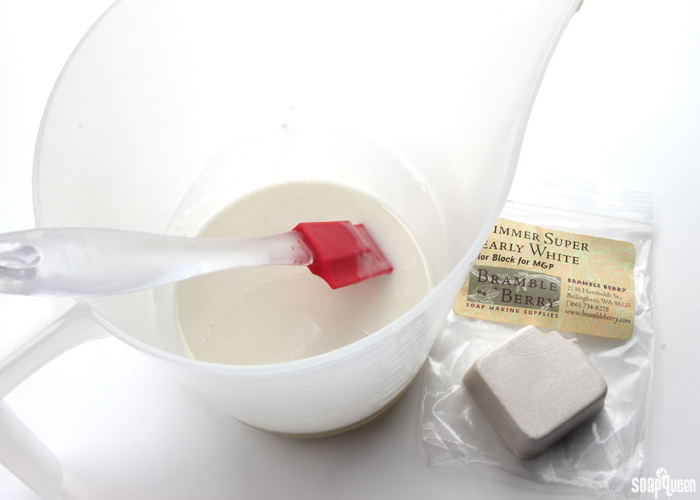 Place the soap into the same container as the leftover Goat Milk Melt and Pour. Adding the clear soap to the small amount of goat milk base gives the bars a semi-opaque look. Melt in the microwave using 20 second bursts, stirring in between each burst. Using short bursts prevents the soap from scorching. FIVE: Add the Spring Meadow Fragrance Oil and Lavender 40/42 Essential Oil and stir until fully incorporated. Add shavings of Ultramarine Violet Color Block until a medium purple color is achieved. SIX: Check the temperature of the purple soap. If the soap is warmer than 130°F, it will melt the white lettering. When the soap is at the correct temperature, spritz the white layer with alcohol to help the layers stick together. Gently pour the purple soap on top and spritz with alcohol to disperse any bubbles. You want to do the layers within quick succession of each other; if you wait even a day for the two layers, they run the risk of not sticking together. SEVEN: Allow the soap to fully cool and harden, which takes about 1-2 hours. Pull at the sides of the cavities to break the air lock on the soap. Flip the mold over. Using your thumbs or the heel of your hand, push the soap out and enjoy! If you’re having trouble getting the soap out of the mold, pop the fully hardened soap into the freezer for 10-15 minutes. Then, use your thumbs to push out of the mold. Have you ever used milk in soap before? What do you think? 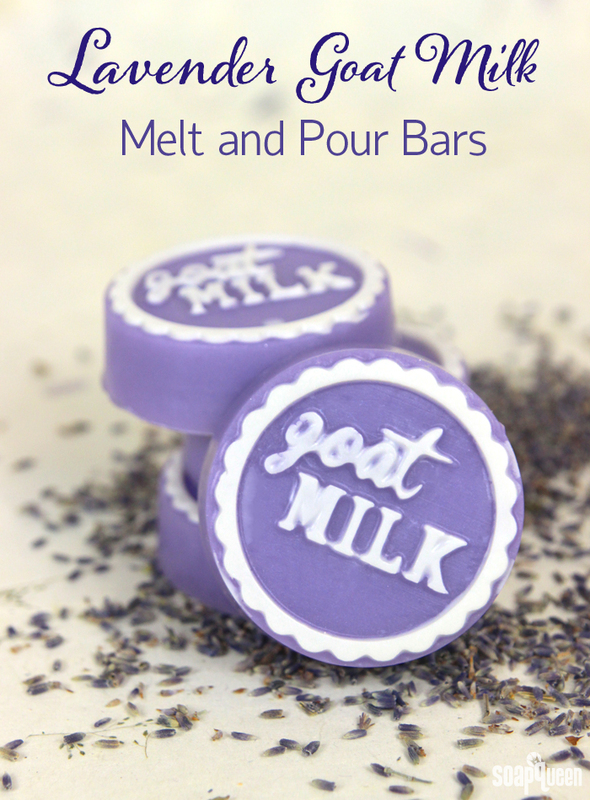 This Lavender Goat Milk Melt and Pour is easy to make and feels great on your skin! Chop 2 oz. of Goat Milk Melt and Pour Base into small, even pieces. Place the soap in a heat-safe container and melt in the microwave using 5 second bursts, stirring in between each burst. Using short bursts prevents the soap from scorching. Add shavings of the Super Pearly White Color Block until the soap has a slight shimmer. Spray the mold with a thin layer of 99% isopropyl alcohol. Using a dropper, squeeze the white soap into the lettering and the border. Spraying the mold with alcohol beforehand helps the soap spread easily into the letters and borders. Spritz the top with alcohol to disperse any bubbles. Allow to fully cool and harden. Chop 11 oz. of Clear Melt and Pour Base into small, even pieces. 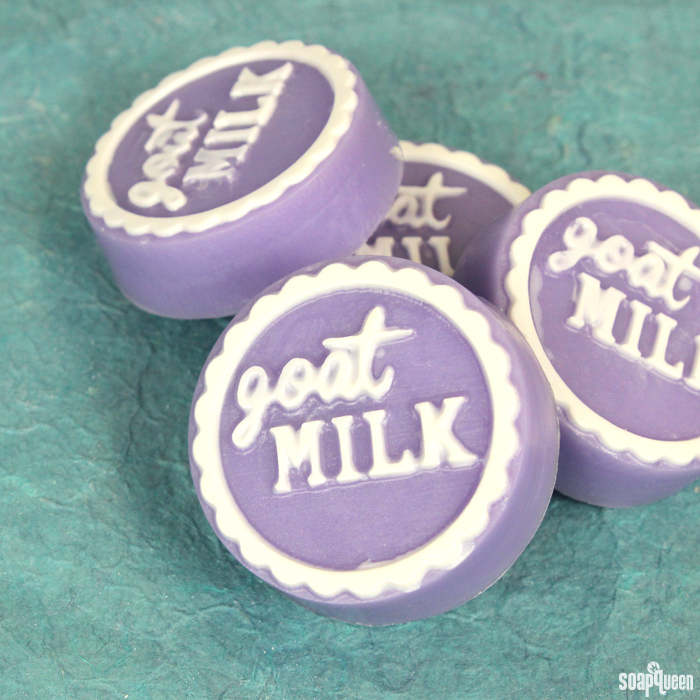 Place the soap into the same container as the leftover Goat Milk Melt and Pour. 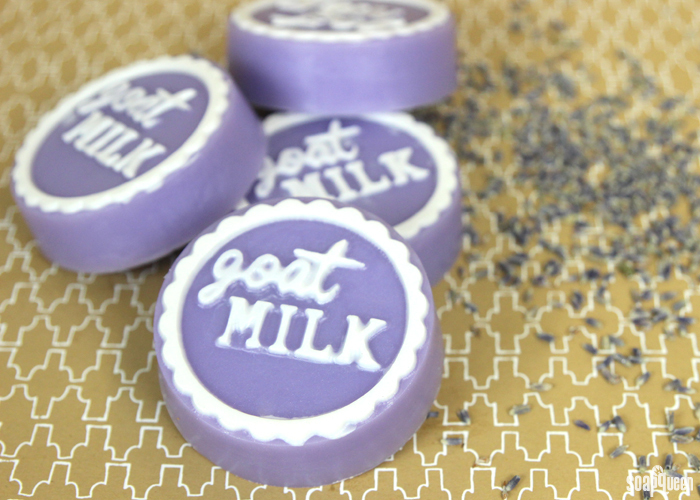 Adding the clear soap to the small amount of goat milk base gives the bars a semi-opaque look. Melt in the microwave using 20 second bursts, stirring in between each burst. Using short bursts prevents the soap from scorching. Add the Spring Meadow Fragrance Oil and Lavender 40/42 Essential Oil and stir until fully incorporated. Add shavings of Ultramarine Violet Color Block until a medium purple color is achieved. Check the temperature of the purple soap. If the soap is warmer than 130°F, it will melt the white lettering. When the soap is at the correct temperature, spritz the white layer with alcohol to help the layers stick together. 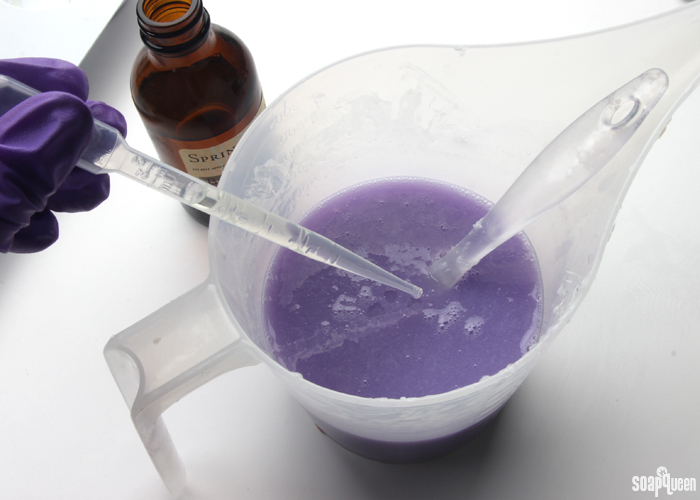 Gently pour the purple soap on top and spritz with alcohol to disperse any bubbles. Allow the soap to fully cool and harden, which takes about 1-2 hours. Pull at the sides of the cavities to break the air lock on the soap. Flip the mold over. Using your thumbs or the heel of your hand, push the soap out and enjoy! If you’re having trouble getting the soap out of the mold, pop the fully hardened soap into the freezer for 10-15 minutes. Then, use your thumbs to push out of the mold. Hi!! I would like to incorporate powdered milk on my M&P soap (because from where I am we don’t have Goats Milk M&P base) should I put a preservative such as Phenoxyethanol (this is the only local preservative we have available) to prevent rancidity? and at what percentage and temperature to add it? thank you very much! We don’t recommend adding milk powder to our melt and pour bases. Even with a preservative, the milk will go bad. Preservatives protect against mold and bacteria, but don’t extend the shelf life of the milk. With the powder added, the soap will have a shelf life of 6 weeks, a bit longer if kept in the fridge. I use melt and pour base to make soaps for favors but the soaps are too soft, I like them much harder like the commercial soaps,is there any way to make them harder? Someone suggested salt as a hardener. What to you think? Hi Kelsey! I only have BB goat milk M&P base, can I get the same result using 1 type of base? Also what would you suggest for a Tiffany blue shade? Thank you for your help! The color will be a bit different. 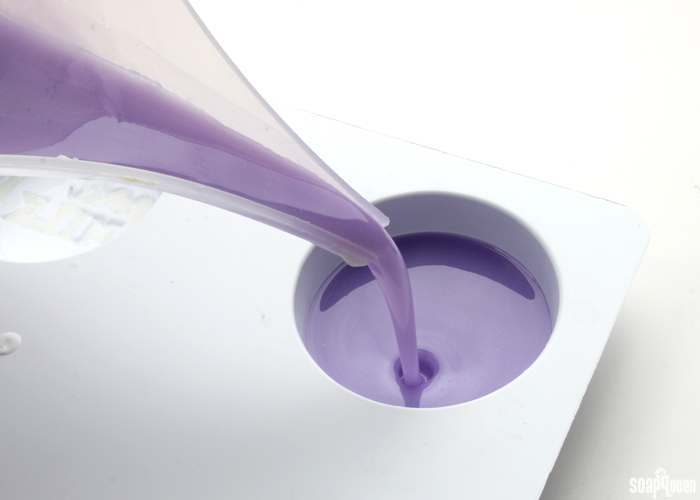 In white melt and pour bases, the color will be more pastel than a clear melt and pour base. It will still be really pretty though! Hi, you know how in cold process soap you can create very thin lines with mica? Can you do this with melt & pour? I really want to make gemstone soaps with gold lines running through them. I am getting ready to make some small round soaps with a cross on top. I am doing this for the church. Is there an implement I can use to easily get the white soap (cross) in the mold first. Then I thought I would add the light blue (after the white has set up) for the rest of the soap. The cross area is small and I don’t know if I can get soap in there without making a mess. Hey, you could try dropping the white soap in with a pipette, waiting for it to harden, spritz with rubbing alcohol, then pouring in the rest of the soap at a cool enough temperature so it doesn’t melt the first layer. This is only for melt and pour though.